Connect all your favourite tools to Publicate to supercharge your workflow and save even more time. Automatically curate content from all your favourite tools into one place, your Content Library on Publicate. Save content with one click as you browse the web. Just install the Chrome, Firefox or Safari extension to your browser. Automatically add anything you Like or post to your timeline, straight to your content library. Feedly is a fast and stylish way to read all your favourites news, blogs and alerts in one place. The best “Read it later” app on the web with a beautiful mobile app. Cronycle is a curation platform that helps you to discover great content and create and monitor custom content feeds from RSS and Twitter. Zapier moves information between your web apps automatically, so you can be more efficient. Zapier connects Publicate to EVERYTHING. Buffer is the simplest way to share on social media. Automatically schedule posts across your social profiles. 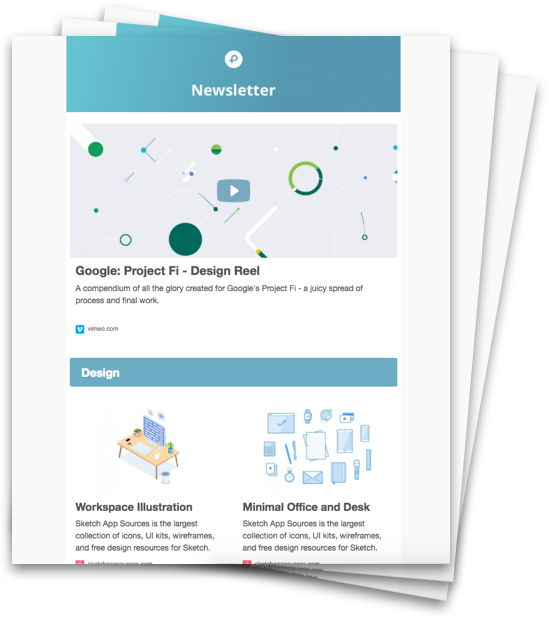 Want to turn content from your favourite tools into beautiful newsletters? The most popular free email service, provided by Google. A heavy weight of email marketing platforms, with simple list management and email automation. The webs most popular software for creating blogs and websites. Anything you create in Publicate can be exported as responsive HTML. Connect Publicate to other tools in your work flow to boost process, collaboration and performance. Productivity tool on crack, Trello helps you work more collaboratively and get more done. What would you like Publicate to connect to next? Get in touch hello@publicate.it or use the in app messanger. Want to connect Publicate to your workflow and create beautiful newsletters in minutes?